ClearShotTM Offers The Ideal Pool Amenity! Don't settle for unsightly plastic or rusty pool sports equipment! 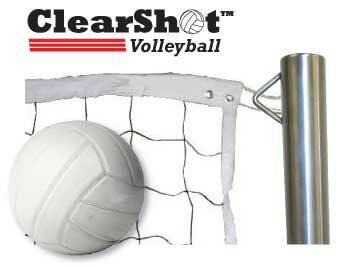 ClearShot products are constructed of heavy gauge stainless steel and clear "Bulletproof Glass" Polycarbonite material. This not only makes them extremely durable but also makes a statement of quality and provides an upscale appearance for any pool. Durable - Our backboard is made from 1/2" thick clear "bulletproof" Polycarbonite material. Rustproof - All metal components and hardware are made of Stainless Steel to minimize rusting. Upscale Appearance - Attractive design does not detract from the quality of the pool. Installs Quickly - Uses standard anchors and fittings. 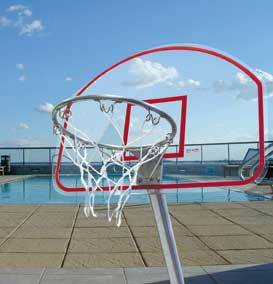 Mini Basketball Includes: Backboard, Goalpost, Rim, Net, Basketball and Hardware. For Pool Builder/Dealer Sales, call your local PoolCorp distributor.